She's Fantastic: Masters of the Universe - DREE-ELLE! Masters of the Universe - DREE-ELLE! 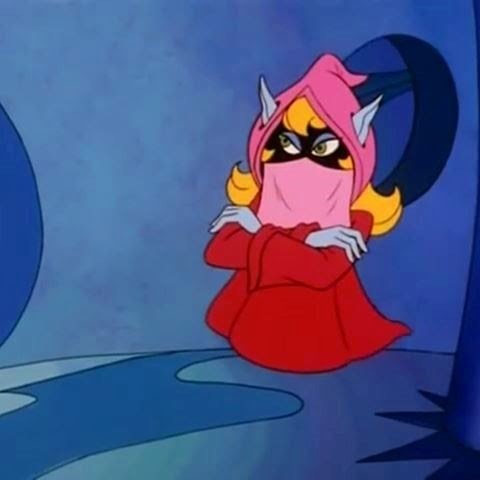 When I was a kid I had a theory about Orko. Here was this playful magical being, with a mysterious hidden face, blue skin, and a high pitched voice. This wasn't too many years after I had outgrown my first childhood love, The Smurfs. The Smurfs were also blue-skinned, had high voices, and displayed occasional (often backfiring!) magic powers. I was certain I had figured it all out. But my siblings weren't convinced by my arguments. But then we met some additional Trollans: Dree-Elle and Uncle Montork (who were clearly Smurfette and Grampa Smurf) and I was finally vindicated! (Right?) Fine. Even if Dree-Elle isn't actually Smurfette, she is definitely a prime example of the Smurfette Principle. 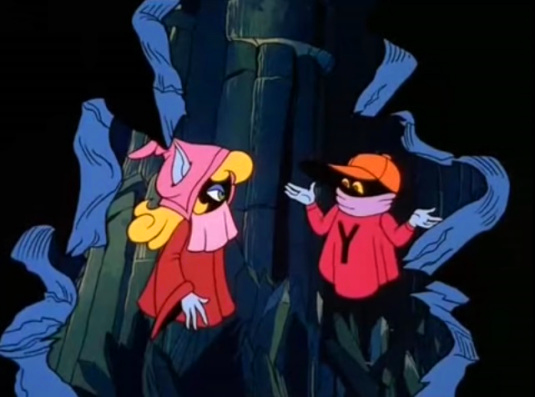 She appeared in five episodes (4 He-Man, 1 She-Ra, Plus the Christmas Special) along with an assortment of male Trollans. Only in her final appearance was another female Trollan shown (Foosabella the Muckess), but honestly Dree-Elle is the most memorable. I'm so glad she got a figure. Let's check her out below! I think this figure is perfect. The sculpt, coloring, and paint-job is spot-on (and also fits in with both Classics figures as well as Club Grayskull Filmation-style figures). The only common complaint I can lend credence to is the quality of the plastic. Parts of this figure seem really brittle. The stand and her corresponding socket definitely need to be softened with hot water before you attempt to attach them. Also, a friend of mine snapped Dree-Elle's ear off just trying to free her from the packaging. Also, there are stress-marks in the plastic around the hem of her robes (especially at the sides). You can see it in the photo below where she is facing left. This piece is solid, but it looks like maybe the figure was assembled when the plastic was still malleable and it almost split. When I took these pictures, I honestly got exasperated wondering which staff went to which character (a common complaint of mine with multipacks). But, duh, their initials are on the top. Dree-Elle's is obviously the purple one. I have Orko's "O" wand somewhere, but I couldn't find it. Dree-Elle has hinge-and-swivel shoulders and elbows, swivel neck, swivel wrists, and her connection to the hover stand is a ball joint. 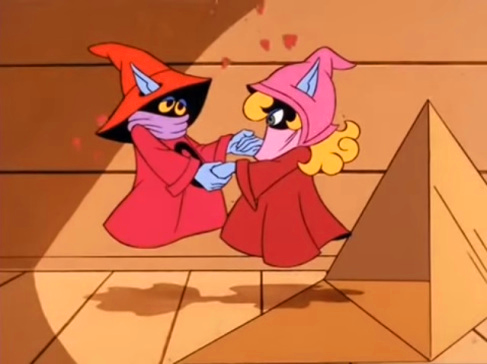 Here she is with her pack-mate, Orko's Uncle Montork. Here are all my Trollans together: Uncle Montork, and Dree-Elle (I don't have The Unnamed One). I love how they're color palettes are all different but complimentary to each other, just like in the cartoon. Never saw her in the cartoon back in the day. Interesting character. 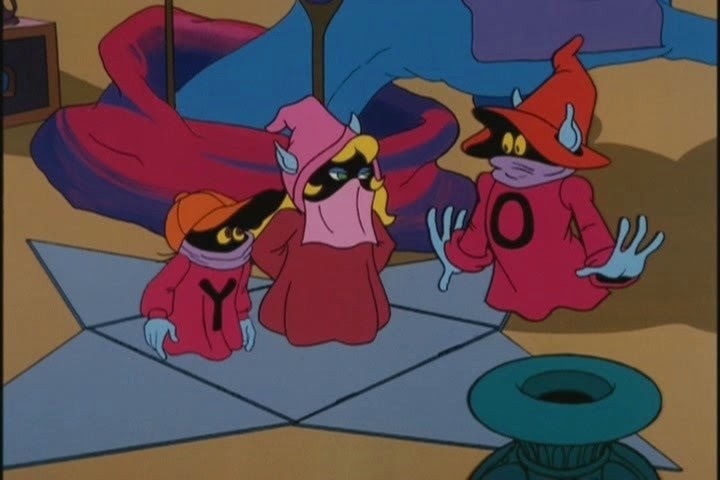 Didn't know there was an Orko family.